For the past 11 years, we've enjoyed hitting the I-4 to attend Florida's annual State Championships. From The Citrus Bowl to the recently branded Camping World Stadium, the city of Orlando aka "The O", was the end goal for every high school team playing football in the Sunshine State. But now that's gonna change. The Florida High School Athletic Association (FHSAA) announced Friday that the upcoming 2019 State Championships will be played in dual locations and will adapt back to the previous format of staging the State Championships in consecutive weekends. The Class 1A-3A State Championships will be held in Florida's capital city of Tallahassee at the newly renovated Gene Cox Stadium during the first weekend of the series. Gene Cox has had recent major updates, including new field turf and two HD video boards. Gene Cox Stadium should be a great choice for the initial 3 State Championships. In the Past 8 years alone, of the 48 teams that played in Class 1A-3A State Finals, 27 (more than half) hail North of Orlando. Defending Back-to-Back 1A State Champs Madison County and 2A State Champs Tallahassee North Florida Christian, both reside in the Big Bend. Gene Cox Stadium's capacity of 6,500 should amplify the small school atmosphere much much better than Camping World's 65,000 seat capacity. Also, with many of the smaller schools within driving distance of Tallahassee and a closer drive for those in the Big Bend, Panhandle, and North Central Florida areas, it should result in an increase in attendance for the State Finals for the Class 1A-3A schools. 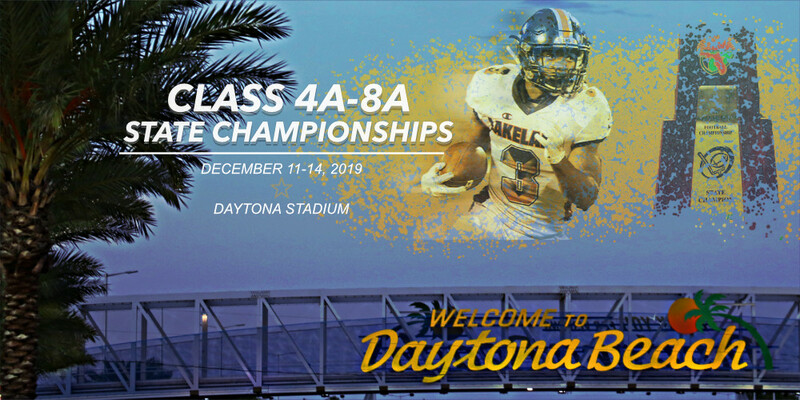 The Class 4A-8A State Championships will be held in sunny Daytona Beach, at one of the premier stadiums in the state. Daytona Stadium will host five State Championships in the second weekend. The recent $20 million renovations to the stadium coupled with an atmosphere of the World's Most Famous Beach and easy central access statewide made Daytona a prime location for the upcoming location to play Florida's most coveted games to enter the exclusive records of the nation's best state for playing high school football. Daytona Stadium, then known as Municipal Stadium, was previously the site of Florida's Football State Championships during two stints: 1989, 1990, and then from 1993-1996. This stadium has hosted some epic feats and played hallowed ground to some of our Florida Legends: How about Miami Southridge's Davis brothers (Troy and Darren) combined 7 TD's in their 1993 dismantling of Bradenton Manatee, 69-36 (the second most points scored in a State Championship Game).. By the way, current FSU Head Coach Willie Taggart was the QB for Bradenton Manatee in this game. Daytona Stadium is the home field of the Bethune-Cookman Wildcats, and has recently been the host of the NAIA Football National Championship for the past five years. Daytona Stadium also serves as host stadium for several high schools in the Daytona Beach area: Mainland Buccaneers and Seabreeze Sandcrabs.